I made this cake a few times towards the end of the summer when oranges were not that great but it was still cake that stood out in the crowd even with sub-optimal oranges. 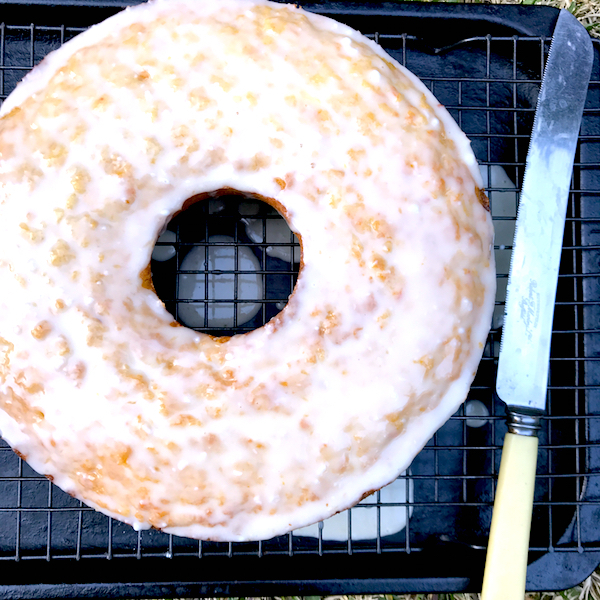 This is a whole orange cake, where the oranges are chopped and chucked pith and all into a food processor, whizzed into mush and thrown into the cake batter and baked. 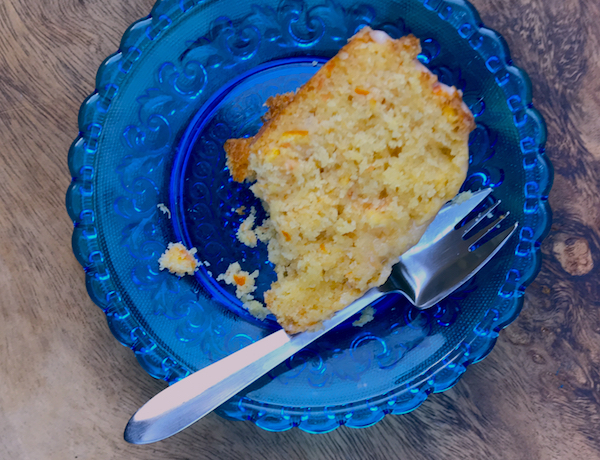 The bitterness of the orange pith mellows the sugar and creates a textured, marmalade-like cake. The name comes not from the Sunset orange color of the cake but from a food and lifestyle magazine Sunset, that was established in 1898 to promote the West Coast lifestyle of America. It’s the first time I’ve come across Sunset magazine but it’s actually pretty good and has an old timey Californian glamour about it to this day. Oranges are really good at the moment, so I’m going through my repertoire of orange cakes. Last weekend when I went for my harbour walk with my friend Alice she happened to serendipitously make this cake. 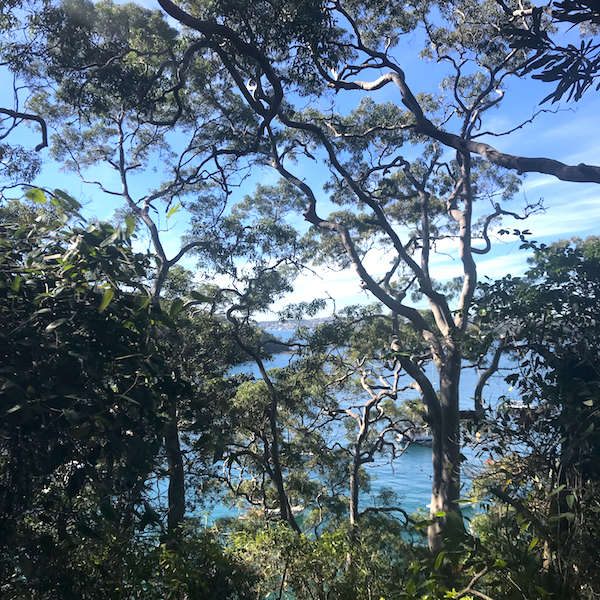 We stopped at our usual morning tea spot at Bradley Point and decided to sit on one of the benches out of the reach of marauding bush turkeys. Unfortunately our higher seat put us in the sight line of a kookaburra who swooped in and snatched a piece of this cake right out of Alice’s hand. This was disconcerting but we recovered, Alice took another piece of cake only to have that piece snatched out of her hand by the same kookaburra, who than flew over to a nearby tree where it sat laughing at us. If you can keep it out of the beak of cake snatching bandit kookaburras this is a nice sturdy cake that is perfect for bush walking. I made it last weekend when some friends came over for a massive tree pruning working bee and it goes well with that kind event too. It’s a working, walking or picnicking kind of cake, easy to transport, not too fancy but still spectacular in its own quiet way. Preheat oven to 160C. Grease and line with baking paper a 25cm ring tin. Whizz oranges in food processor until mushed but not too smooth. (you want a bit of marmalade-like rind and texture through the cake. Sift or whisk together flour, salt, baking powder and bicarb soda. Beat butter and sugar until light and fluffy, then add eggs one at a time and beat until incorporated. Add about half of the orange mush to the butter and sugar, then then half the flour mix and beat through. Add the rest of the orange mush mix through then mix through the last of flour and mix through. Pour batter into tin and even out top with a spatula. Bake for 55 minutes or until skewer comes out with a few crumbs clean. Leave in tin for ten minutes before turning out onto a rack and cooling completely. Mix together icing sugar and icing sugar. Spread over cake to ice.